William Jefferson's resume reads like an American success story, at least until the end. His parents were sharecroppers who never finished high school, but Jefferson became a civil rights activist in the late 1960s, and later earned his law degree at Harvard. He ran for Mayor of New Orleans and lost, twice, before running for Congress in 1990, when he defeated, among others, future Mayor Marc Morial and Ted Koppel's cousin Woody. He became the first African-American to represent Louisiana in Congress since Reconstruction. 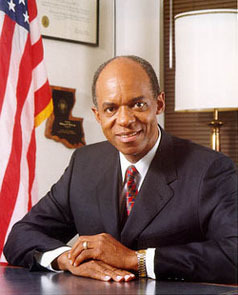 Representing New Orleans and some of its suburbs in Congress, Jefferson supported NAFTA and CAFTA, and earned the nickname "Dollar Bill" for his willingness to make deals. He ran for Governor of Louisiana in 1999, but lost to Republican Murphy J. Foster, Jr.. Remaining in Congress, Jefferson was a low-profile politician, known primarily for working to expand trade opportunities between America and Africa. His campaign literature bragged of such accomplishments as fighting against steel tariffs and sponsoring changes to the “tonnage tax” assessed against U.S.-flagged transport vessels. His largest campaign donor, by far, was the Association of Trial Lawyers of America. In 2005, the owner of iGate Inc, a small high-tech company, admitted paying $400,000 in bribes to Jefferson to facilitate contracts in Nigeria, Ghana and Cameroon. In an FBI sting, Jefferson was videotaped accepting a $100,000 bribe, and saying that he would give the funds to Nigeria's Vice President "as a motivating factor" to secure contracts for iGate. Three days later $90,000 of the cash was found in Jefferson's kitchen freezer, "wrapped in aluminum foil and stuffed inside frozen-food containers". A former aide of Jefferson's pled guilty to related charges, but Jefferson maintained his innocence. Democratic Party leadership immediately kicked him off the powerful House Ways and Means Committee after the scandal broke, and Jefferson complained that his removal was evidence of racism. Even amidst the scandal, he easily won re-election in 2006, and he was finally indicted in June 2007. Initially heavily favored to win re-election in 2008, he lost his re-election battle in a late December race (elections for certain House seats in Louisiana were postponed following Hurricane Gustav) to Republican Joseph Cao by just over two percentage points. Jefferson was convicted on 11 of 16 counts in 2009, and sentenced to 13 years in prison.